Please refer to our stock # 1796 when inquiring. 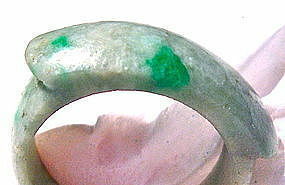 Antique far eastern Asian Chinese hard stone late 19th century to early 20th century Chinese green jade jadeite saddle ring that was carved from one piece of this coveted lucky hard stone. This Chinese far Eastern export carved green gemstone saddle ring is in excellent wearable condition. Although not seen here, the top takes a high glossy polish. There are no new crisp edges to be found in this ring. It shows beautiful bright imperial green spots and a couple of darker areas, just enough to create contrast. 6.75 to just under 7.
shank at the shoulders is 8mm wide to 5mm at the narrowest. Back lighting shows transparency and bright green areas through and through. A very desirable antique Chinese green jade saddle ring in preowned condition that has been in this dealer's collection for many many years. This is not to be confused with the newer ones seen at other auction sites. $15 USPS Priority/Ins/Track or Free with USA Ck or USPS Money order. Please collect with confidence after reviewing the dozens of Trocadero verified testimonials, then view All Extreme close up images for more info, as all Qs will be answered here in lieu of email reply. If not happy, there is a generous exchange policy in place. International: Please employ American buying service to submit USA USPS postal money order funds and receive this at a USA address only. Reply: Ms. L, please find an American buyer to receive this for you. See above "International" terms.